Our custom size photo printing can help you fill any wall space you're looking to decorate with a gorgeous framed canvas print. We make the wooden frames to meet your sizing requirements, giving you a truly bespoke feature for the home. Add photos, text or designs to create the perfect custom size canvas print for your home or office. Choose depth: 0.98" or 1.77"
Whether you’ve got an alcove that needs some TLC or a recessed wall you’d love to make a feature of, this is the perfect solution. We make the wooden frames by hand to meet your specific needs and print onto our 8.85oz Canvas using a specialist printing process. This locks in the color and gives a full color, lasting print. Whether it’s an addition to your home or a gift for a friend, it’s 100% bespoke. Choose the depth: 0.98" or 1.77"
Get your Mum and Dad an unforgettable anniversary gift by creating a photo collage framed print. Full of special memories from throughout the years, this is a really thoughtful present. New homeowners looking for fresh decoration ideas would also love a custom canvas to spruce up the new pad with some life and color. 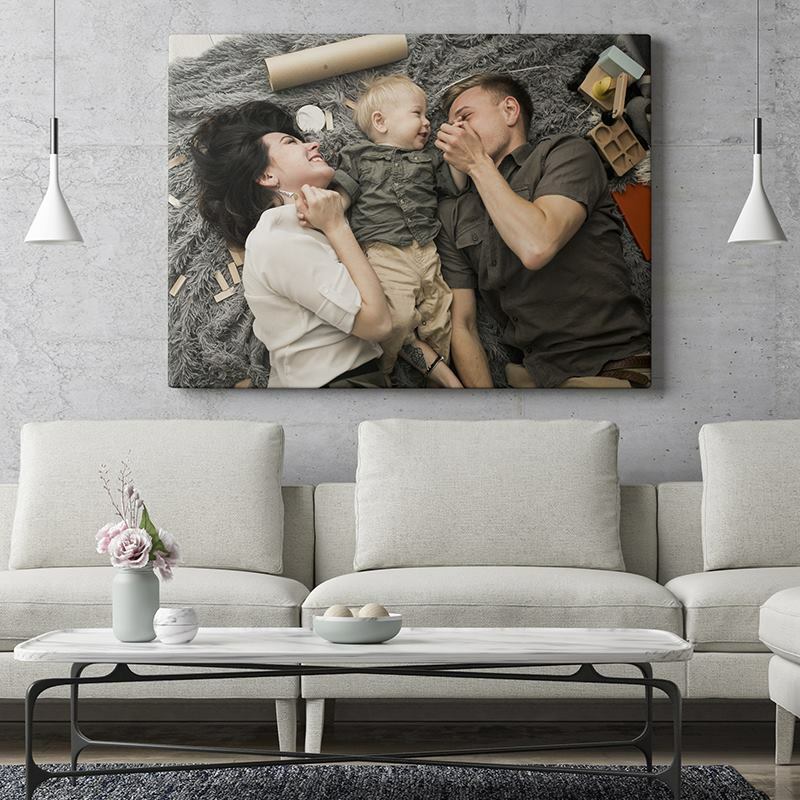 Your photo is printed directly onto the canvas material. This is done with a digital printing technique which expertly bonds the ink to the fabric, by infusing it deep into the fibers, rather than leaving it sitting on the surface. Our canvas print sizes can be any dimension up to the maximum 57.08" x 196.85" with a frame width of 1.77". The frame comes in two depth sizes and the sides are automatically mirror printed, so aspects of your main photo canvas are copied. Turn a plain wall into the main feature and showcase your own artistic efforts. Hung over the fireplace, a framed canvas print of your drawings would be an impressive talking point amongst guests. If your family has a motto or notorious saying, design your own custom canvas prints with words. Monogram wall hangings are super chic and look stunning against a solid color.